Nicholson Boys: Meet my Lil Bruisers! 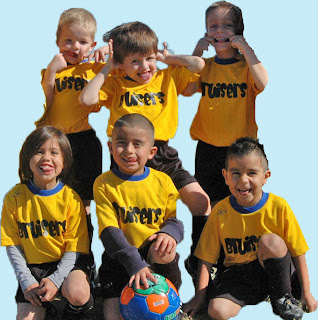 Since this is the final week of being the coach of the Bruisers, I thought I would let everyone meet the little men on my soccer team. #5: My FAVORITE Bruiser!!! Corbin and another little boy made the majority of the goals this season. (probably all but 5 goals) We are super proud of him! Our last game is this Saturday, and although it's going to be sad, it's also going to be a relief! Coach Shawna took on way too much this semester between 5 classes and coaching 5 year olds! I'm ready for my Saturdays to be a little less busy! 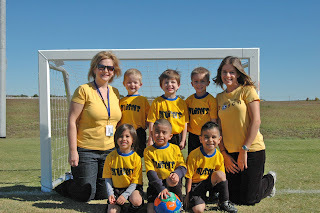 I would also love to say that this was my one and only time of coaching, but when your 3 year old says "Mommy is going to be my soccer coach too!" , I have a feeling that it would be a lie! The team is so cute and the name is awesome. I'm sure Gage will want you for a coach too and the good news is now that you have done it perhaps it will be easier. I don't know how you have the energy to do all that you do.